A small family run farm with two lovely rural houses in the small village of Penelles, in the Noguera district, bordering Urgel i and Pla d´Urgel, in the province of Lérida. Cal Pauetó is made up of two semi-detached houses, to the north they lead out onto a village street and to the south there is a large patio, where you can enjoy its lovely terrace, the swimming pool which is lit up at night to give a relaxing atmosphere on those summer evenings, a tennis court, barbecue, games rooms with table football, table tennis…. and a fantastic view of the Urgel plains. All within a private piece of land, where you can enjoy total peace and quiet. In other words, if what you are looking for is a rural house with a swimming pool, close to the Ibars reservoir, other places of interest in Lérida, or Catalonia, where you can enjoy a peaceful village holiday or a delightful rural tourism weekend, then what you need is one of our totally independent rural houses. The two houses that make up the Cal Pauetó, are divided up into three apartments:. 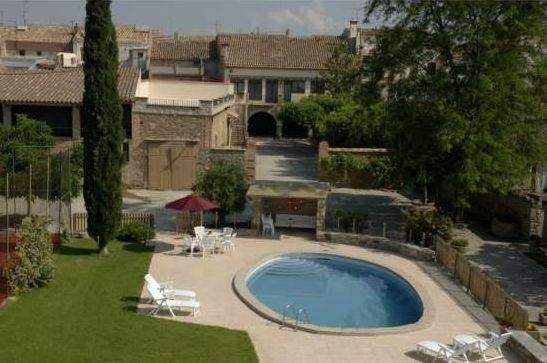 - La Casa Gran: which sleeps 12/18 people. It has five double rooms and one quadruple, with three complete bathrooms, a small library, a fully equipped kitchen, a lounge dining room with a fireplace and an adjoining room. - El Portalet 1: Sleeps 4 people. It has two double rooms, a complete bathroom and a kitchen-dining room with a fireplace. - El Portalet 2: Sleeps 6/7 people. Situated on the second floor, it has three double rooms, two complete bathrooms, a fully equipped kitchen, a large lounge-dining room with a fireplace and a small sitting room. - And a large Patio where you can enjoy its swimming pool, tennis court, barbecue, arched area with a fireplace, bathroom, the service room with a washing machine and a games room with table football, table tennis…. All on a totally private piece of land. - El Celler: a large lounge which has been recently equipped and decorated, seating around 50 people, where you can enjoy family parties, or with friends... and also suitable for company conventions and other social events. - All in a private area. The three apartments can be connected, allowing you to rent them separately or together for large groups of between 22 and 29 people. Realmente impresionante, entre otras cosas, por sus dimensiones, hay mucho, pero que mucho espacio, éramos 23 personas y ninguno de los presentes llego a tener la necesidad de salir a dar una vuelta, con lo que la estancia nos salió realmente redonda, por que ya se sabe, en muchos lugares, al estar justos, necesitas salir y terminas gastando mas de lo que pensabas, en nuestro caso, descansamos nosotros y descanso nuestra cartera. hemos estado en esta casa 28 personas para celebrar un cumpleaños y ha sido perfecto. Toda la casa es inmensa, con un montón de salas y ambientes, para los niños y los adultos, no le faltan instalaciones de ninguna clase, con todos los detalles y además está todo super limpio. Realmente no hemos encontrato ninguna casa igual y seguiremos repitiendo (ha sido la segunda vez que vamos). Además los dueños nos han dado el contacto de una empresa de catering, que por un módico precio nos ha traido el menú, así que ha sido perfecto.